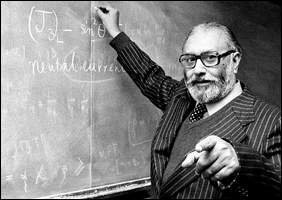 Dr. Abdus Salam – Pakistan’s finest scientist and the only Nobel Prize winner – passed away 14 years ago today. He was a patriot par excellence. It was in 1959 that Jawaharlal Nehru, who had an eye for talent and appreciation of Physics, tried to woo him to India. Dr. Salam refused and offered his services to Pakistan’s president General Ayub Khan instead. The contributions of this great man to the promotion of science are too many to list. Shame on those idiots, crooks, cranks and madmen who attack Salam because of his faith. Most of those idiots have never amounted to anything. Dr. Salam Zindabad. Pakistan Paindabad. Let’s not waste the blasphemy law, please! We are linking here a hilarious and yet tragic piece written by Ejaz Haider which is an apt commentary on how far we have fallen. Pray, what is this National Commission on the Status of Women (NCSW)? Terrible the very fact that such a commission is functioning here to turn good Muslim women into monsters by giving them funny ideas. What makes it outrageous is its defence of Aasia Bibi, the Christian woman who blasphemed and has been, in our mercy, sentenced to death by hanging, which, arguably, is better than being lynched. But no, they want to make a big thing out of it, like some people today talk ill about Henry VIII for getting rid of some of his wives. What’s a man supposed to do when wives become troublesome? He merely acted in good sport and did the routine, though slightly more imaginatively. So, please, let’s get some perspective on these things. Now this NCSW, I am told, has strongly condemned the death sentence an additional sessions judge, in his infinite wisdom, has passed on Aasia Bibi. Worse, it is now talking about gross irregularities in the judicial process and questioning how an illiterate Christian woman could have cited Islamic textual and exegetical references to blaspheme against the Prophet (pbuh). Investor is the first bird to fly away when there is a remote possibility of instability and fear of disregards for international contracts. Populist rhetoric of half-learned scholars and opportunists politicians that corruption and lack of accountability are responsible for discouraging investment does not makes any sense. Although these two factors impact the investment decisions, the studies suggest that authoritarian regimes with massive corruption and lack of accountability has attracted equal investments as did the transparent and democratic governments. In reality, the authoritarian regimes are favourite of international investors while corruption, kickbacks and commissions are established practice of doing business in corporate MNE’s. From arms deals to explorations licences and from Foreign Direct Investment to award of development projects,;corrupt practices, political influences and reactivity commissions do exist at varying levels. The biggest fear of any investor lies in uncertainty and discontinuation of policies of host state where institutions become dysfunctional because of internal conflicts. In case of Pakistan, much glorified case of preventing privatisation of Pakistan Steel Mills by Supreme Court of Pakistan, played a key role in breeding uncertainty. As the judgement is a public document, it is open for criticism, but very little has been said and written on it’s impact and constitutionality apart from securing political mileage against an unpopular dictator. In terms of investor confidence, the judgement proved to be an absolute disaster for privatisation and Foreign Direct Investment (FDI). The most vocal economists in country who are aware of its disastrous consequences on economy remain silent because of fear of backlash from supporters of popular Chief Justice. The story of the biblical character ‘Job’ or Ayyub, has intrigued me ever since I first heard it at the age of seven. Job was a wealthy man who had many wives and children and was the head of his clan. Apparently, one day Satan pointed out to God that the reason Job was so pious and thankful was because he had many things to thank for, at which God took some objections. God was determined to demonstrate to Satan that Job would be thankful under all circumstances. As a proof, God took away all the wealth of land and cattle and Job and his family had to live in poverty, yet Job remained thankful. Job’s wives and children died off, yet he remained thankful. Job himself was subjected to unspeakable diseases; it is said that as the worms would fall off of his open wounds, he’d put them back and offer thanks to God who had bestowed His blessings upon him. After having proved to Satan that Job was indeed a pious man with our without the favorable circumstances, God returned all the wealth and cattle to Job and he acquired new set of wives who bore him many more children than before. Job was well rewarded for his steadfastness and patience. The story ends here..or does it? The first time I heard it, I was struck with despair. As soon as the story teller ended the story, my first question was, “what about the wives and children who died for the sake of this experiment?” The story-teller said that it was the will of God, they had to die. “The point of the story,” he added “is that Job was patient, thankful and steadfast in his faith. The story is not about his wives and children and cattle. You are missing the point.” Missing the point? Whose point? Am I missing the point or the point-of-view? I had so many questions. Why was only Job’s patience rewarded and why were his wives and children punished in the process? Did Satan effectively tricked God into making Job suffer, even if only temporarily? Why was God ‘conversing’ with the Satan in the first place? A child’s curiosity knows no bounds. When I grew up I realized that Job was not the only person in Bible or history whose point-of-view happened to be more important than that of his peers. History was written from the point of view of winners or rulers or at least the writers of history. The losers, the subjects and the cultures without a writing system were treated like Job’s wives…collateral damage in the grand scheme of things. History is not the only thing affected by the plague of point-of-view. Religion is another major example. Every religion sees the world from its point-of-view, which happens to be the most correct, of course. I remember watching a debate on TV recently over the Islamic law of apostasy. A Christian who converts to Islam should not be killed by Christians for his apostasy, but a Muslim does deserve to die if he converts to Christianity. The debating Islamic scholar on the TV was trying to defend this law because converting to Islam saves souls, something his opponent, a prominent Christian scholar, claimed to do as well. The real battle was whose point-of-view was valid. It was clear that if this apostasy happens in Pakistan, the mullah will get his way and if it happens in a Christian country, the bishop will get his. The religious texts are almost always revealed through men, written down by men, interpreted by men and legislated by men. Whose point-of-view, do you think, is reflected in this process? A gross misconception is that “Islamic Law” is written by Allah Himself. People defend Islamic teachings, interpretations and legislations as if they are divine, nothing can be farther from the truth. A man can divorce his wife with or without reason in the blink of an eye, but a woman has to get a judge’s permission to divorce her husband. A judge, who can be bribed, threatened or manipulated. It is quite clear whose point-of-view is being catered here. There are other laws and interpretations that blatantly disregard women’s rights to safety and property etc. These laws and interpretations are not only defended by Muslim men, but also by Muslim women who are mislead into believing that challenging these interpretations is synonymous to challenging Allah Himself! Time has come that we re-examine our stories not just from Job’s point-of-view but also from his wives’ perspective. Where we question why was God in counsel with Satan and why was Satan interested in Job’s piety? It will be a mistake to take the centuries old stories at their face value without investigating into the various point-of-views injected in them over the course of time.